Several weeks ago I created a long suggestion on the SmugMug voting forum. Today, I returned to check out how many votes my idea had received only to discover that the suggestion has apparently been deleted. Professional photographers need an **easy** way to empower clients, allowing them to pick their favorite photographs from existing SmugMug galleries. - Administrators should have an easy to use method to send an e-mail invitation to select end users. The dynamically created, unique link should provide the end user with the ability to create their favorite picks. - If the gallery is password protected, then the password must be entered. If the gallery is not password protected, then the end user will enter the gallery automatically and select their favorites. For ease of use, it is important that the user be able to complete this step without logging into or registering. This can be facilitated with a unique URL identifier that is associated with each administratively created invitation. - Administrators should have the ability to a) view the Favorites associated with any invitation (in gallery view) and b) view and/or download a list of file names associated with the favorite images. 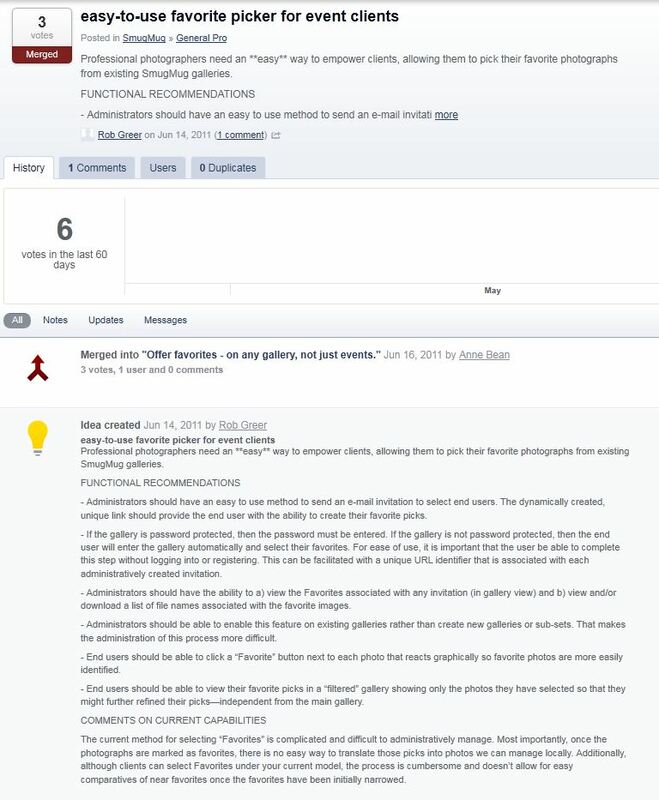 - Administrators should be able to enable this feature on existing galleries rather than create new galleries or sub-sets. That makes the administration of this process more difficult. - End users should be able to click a “Favorite” button next to each photo that reacts graphically so favorite photos are more easily identified. - End users should be able to view their favorite picks in a “filtered” gallery showing only the photos they have selected so that they might further refined their picks—independent from the main gallery. The current method for selecting “Favorites” is complicated and difficult to administratively manage. Most importantly, once the photographs are marked as favorites, there is no easy way to translate those picks into photos we can manage locally. Additionally, although clients can select Favorites under your current model, the process is cumbersome and doesn’t allow for easy comparatives of near favorites once the favorites have been initially narrowed. A lot of times, similar items on the feedback forum are merged without any notification to the creators of those ideas, so it looks like they were just deleted. I'd search and see if you find a similar idea. I did that before posting here. I even used Google. And, since I have the original text I posted, unless the "modified" post wasn't indexed by Google, it doesn't exist. Sorry about that. You posted on June 14th and it was indeed merged into another idea. Thanks for the feedback! Thanks a bunch for letting me know, but I think you'll agree the suggestion it was merged with does not have the same functionality I described in my posting. I'm hopeful it will be considered a stand-alone suggestion this time. I wasn't notified about the post being deleted. Given that behavior, I interpret that to mean that they (SmugMug) didn't want their customers complaining about a problem with the Pro version of their system. We pay a lot of $$$ for that feedback system, and we very much want your input and ideas! As you can see, we did merge it - and you are supposed to receive an email when ideas are merged. Perhaps it landed in your spam folder? Please check and let me know, I do want to make sure there's not a problem with notifications. Thanks! Perhaps it landed in your spam folder? Please check and let me know, I do want to make sure there's not a problem with notifications. Thanks! I just did a search in my deleted items and junk folder (for any matches to "smug") and didn't see any notices from the forum. I agree they are two different suggestions, yours referring to any gallery and the one it was merged with has to do with events. I wanted to give you a heads up that I've gone ahead and re-merged this idea with the same one that it was merged with a number of years ago. Before you go ahead and ask "WHY MAKE THE SAME MISTAKE YOU MADE YEARS AGO" I wanted to explain myself. At this point I view favoriting as one idea ... regardless of whether or not it's events or galleries. Favoriting should work the same for the entire site. An easy way to favorite photos and be able to interact with those favorites. It's confusing for our users to see so many ideas related to favorites when being able to easily favorite their photos is really what they're looking for. For the record, Rob, your write-up on what features you'd like was amazing. I wish more people created ideas with the detail and thought that you did. I've copied your text into the merged idea so that it won't be lost!